Known as the 'Independent North Mansion' and christened by Sydney Herbert as 'Belgrave Villa' and then simply 'The Villa' by his successor the 6th Duke of Richmond. Owned by Argentina since 1936 and with sumptuous interiors still intact. 49 Belgrave Square is a four-storey mansion built around 1851 for Sidney Herbert, later Lord Herbert of Lea, by Thomas Cubitt in “his later manner, quoined and astylar [without columns or similar vertical features] with a canted bow”. The porch and octagonal hall were added in 1859 by Mayhew and Knight and the interiors modified by Mewes and Davis before 1914. Because of its position between Halkin Street and Grosvenor Crescent, the building was known for many years as ‘The Independent North Mansion’ though named as ‘Belgrave Villa’ by Sidney Herbert and as ‘The Villa’ by his successor in 1861, the 6th Duke of Richmond. After the 7th Duke died in 1928 the house was acquired by the gold and diamond magnate Sir Otto Beit and sold by his son Sir Alfred in 1936, when it became the residence of the Argentine Ambassador. The rooms available for viewing are on the ground and first floors. The ENTRANCE HALL has an ornamented fireplace and bas-relief sculptures. The PINK ROOM and the GREEN ROOM both have ornate fireplaces and the latter panelled walls. These rooms lead successively into the spacious DINING ROOM with its cream panelled walls and dark pink marble fireplace. The grand STAIRCASE at the end of the main hallway near the entrance to the dining room has black-painted wrought iron ornamentation and a brass rail. It curves round to the first-floor landing, at the further end of which a similar spiral staircase continues to the upper floors below an oblong skylight. 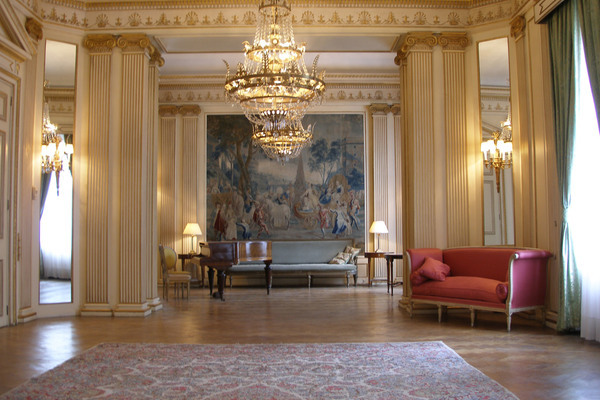 The elegant BALLROOM has Ionic columns and cornice decorated in gold and full-length mirrors set in the walls. On both floors doorways are generally pedimented and lighting is provided throughout by chandeliers. Increasingly over recent years the Residence has been used for conferences, concerts and presentations with the aim of promoting cultural and business links between Argentina and United Kingdom. The Argentine Ambassador’s Residence has witnessed many significant events throughout the last 70 years such as the creation of the emblem of the Argentine Volunteer Squadron in the Second World War; the lodging of the very young John Kennedy; a bomb falling in 1941 which did not in fact explode; the reception organized in 1990 for the restitution of diplomatic relations between Buenos Aires and London; the official visits of three Argentine presidents; and two contemporary art exhibitions ‘Casa Abierta – Open House’ which took place during Open House London 2006 and 2010. For the 14th year running, we invite visitors to delve into Argentina’s cultural roots — from music to the arts — and to experience a journey through Belgrave Villa´s history and architecture, with its sumptuous interiors still intact, including a collection of paintings, furniture and tapestries. Our guests will enjoy a presentation of Argentine sound, art and design by the Argentine Centre for Sound Art (CASo) and artist Clara Pinto, and a preview of the Argentine pavilion at the London Design Biennale.